Coming up with different ways to make your event, project or experience unique involves a lot of creativity. And here at TSV, we are fueled by creativity...and coffee, lots of coffee. Today we are going to look at projects large and small that our team helped take to the next level with the creativity of production! OmniUpdate, a web content management provider, called on TSV to produce their 4-day conference at the Millennium Biltmore Hotel in Downtown LA. 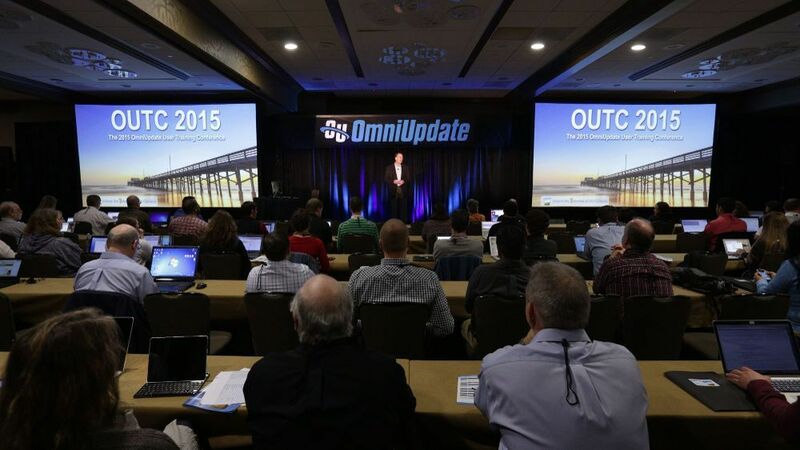 Going into the 10th year of the conference, OmniUpdate wanted to take the event’s production up a notch. 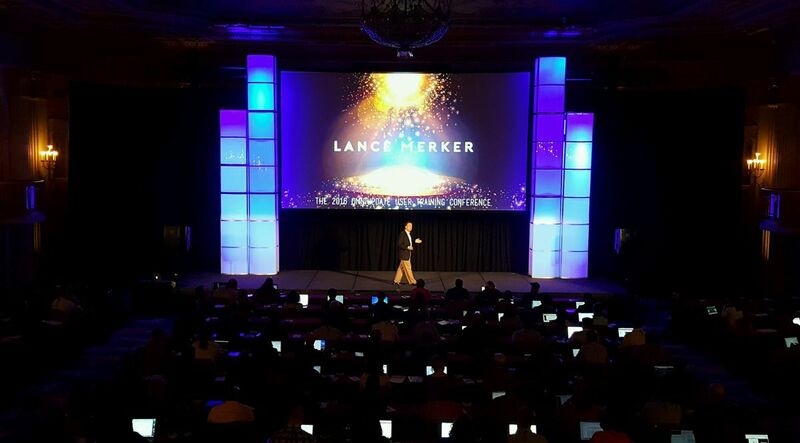 The TSV team did just that by putting our creative production skills to use with our 20,000 Lumen Barco projector and plexiglass columns, which made a big scenic impact. We also provided a full JBL sound system, Blackmagic ATEM video switcher, pipe and drape and a camera crew. 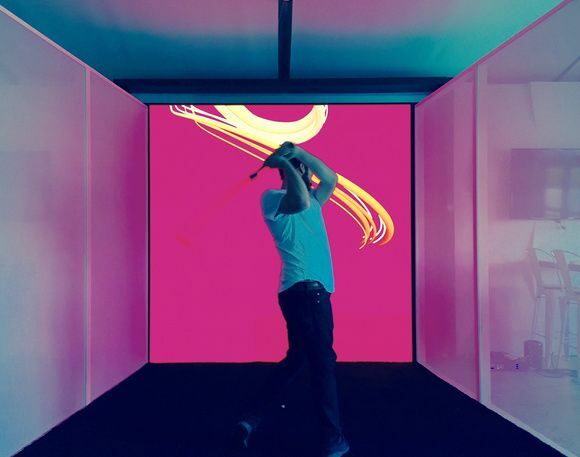 Our team also delved creatively into a project we did with Red Paper Heart at the U.S. Open Golf Tournament. We wanted to create a unique visual effect that would engage and entertain guests. That’s where the “signature swing” came in. This allowed guests to create their own special piece of art. Red Paper Heart developed a golf club that captured the trajectory of the golf swing, and we helped to translate the movement onto our 8’x8’ LED wall setup. Our team decided to use an Absen 2mm LED wall for stunning high definition visuals, and programmed all of the back-end processing for the LED wall as well. With our help, this creative and unique project entertained guests and allowed them to make something beautiful in an extraordinary way. Here at TSV, we go big, and when Hyundai announced they would be the new official auto sponsor of the NFL, we knew we had to go even bigger. Hyundai wanted to do something special to celebrate the new relationship and video mapping the side of their 300 ft wide, 100 ft tall building was the perfect way to do so. TSV set out to design a system that would provide incredible brightness, and that would overcome some of the geometry challenges posed by the job-site. This project was challenging, but that didn’t stop our team. To project the image on such a large space, we used ten Barco HDX-W20 high definition 18,000 lumen DLP projectors, combined with 1.16-1.49 lenses. Barco's native 16:10 aspect ratio enabled us to achieve greater height in our projection. 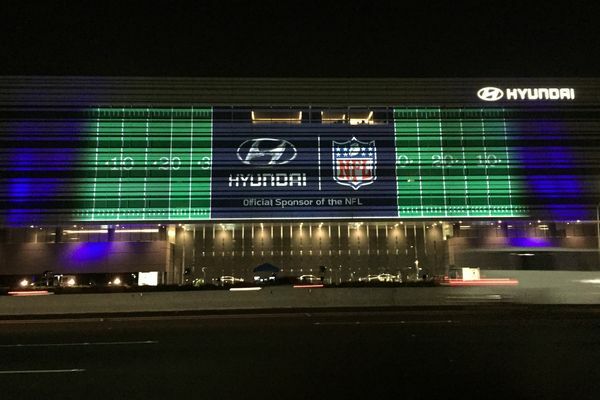 The final product was an ultra-wide, incredibly bright display that drew thousands of eyes to the new partnership between Hyundai and the NFL. Regardless of the project, TSV is always excited to help our customers create something innovative. The coffee is brewing here at TSV and so are the ideas! Call us to brainstorm today!